NEW ASK LADA, with Lada Ray PREDICTIONS! The weakening of the Russian Church is the US plan in order to hurt Russia as the biggest and main Pravoslavny (Orthodox) state. Russian Church is one of the foundations of the contemporary Russian state, it’s the glue that helps holding the Great Balancer together. Destroy the Church – you’ll weaken Russia. Will they succeed? Temporarily yes, as confusion and in-fighting intensifies within the global Orthodoxy, and as many independent regional churches are forced to choose sides. There is much grief and tribulations expecting the people of Ukraine, as well, since the corruption reached astronomical proportions and the people allowed the ukro-nazi junta to take over. The so-called ‘managed chaos’ is the US plan for the entire world. Not just for Ukraine or the Russian Church. It is the same exact plan for the US European ‘allies,’ and for China, and for Asia, and for Latin America. Everyone and everything, from the US perspective are pawns in the big game. Don’t forget, the US is feeling the heat, its power is slipping away all around the globe and as I was predicting before, they’d do anything and everything to preserve this ill-gotten power! By instituting a wholesale chaos around the world, whether it’s global trade wars, sanctions or religious wars, the US hopes to again improve their status and prevent the collapse! Long-term they’ll certainly fail. In the end, I see the Constantinople patriarchy hurting most as a result of its betrayal of he Russian Church and the centuries-old canonical principles. As a result, it may be stripped of its privileges or even disappear. It certainly will lose much of its reputation. It appears however, that Bartholomew, blinded by ego, jealousy and hate, is ready for the global religious war in order to become a schismatic ‘Orthodox pope,’ and to earn his cash. Per recently voiced accusations, he received $25 million from the US. It’s also unclear what role is played by Turkey in this whole scenario. But whatever happens, Russian Church must go through a cleansing and re-evaluating of priorities process, in order to determine who they can or cannot trust. NOTE! We all individually, and every single country, will have to go through the same process as part of the EARTH SHIFT! In the end, I predict that RUSSIA THE GREAT BALANCER WILL COME OUT A WINNER! LINK: Община Флоренции ушла из юрисдикции Константинополя в знак протеста против решений по Украине (RUS). Translation: Orthodox community of Florence left Constantinople Patriarchy in protest against decisions on autocephaly for Ukrainian Church. 1 НОЯБРЯ 2018 Г. ПРАВМИР. Приход храма Рождества Христова и святого Николая Чудотворца во Флоренции перешел из юрисдикции Константинопольского Патриархата в Русскую зарубежную церковь. Решение об этом было принято в знак протеста против действий Фанара на Украине, пишет издание Parlons D’orthodoxie. The community said that ‘they stopped understanding Constantinople Patriarch’ and couldn’t go on with him. 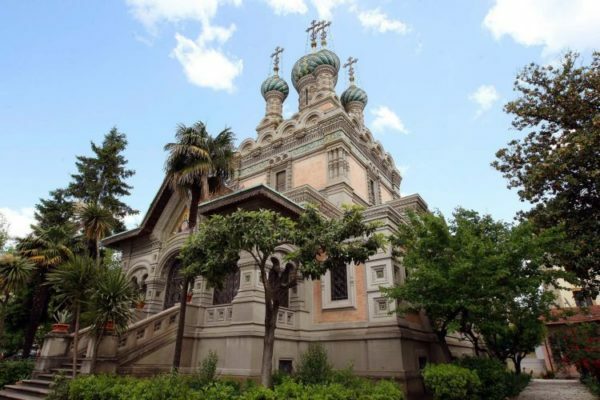 Florence church now joins the Russian Orthodox Church Abroad, which is an autonomous branch of the Russian Church. Incidentally, The Russian Church Abroad, uniting Pravoslavnie (Russian Orthodox) believers from N. America to Australia, already expressed its complete disapproval of the schism orchestrated by the Constantinople Patriarch Bartholomew. So did a number of other Eastern Orthodox churches, including the Church of Alexandria and All Africa, Church of Antioch and All East, and Church of Jerusalem. How many other church communities will leave Constantinople patriarchy? Will this religious war split and weaken the global Orthodox church? Yes, it will, as this is the original design of puppet masters, in order to weaken and destroy Russia, by hitting at its mainstay spiritual foundation. But this will backfire in the end for those who have masterminded this scheme. By latests polls, 92% of Ukrainians will stay with the Russian Church, Moscow Patriarchy, and they are ready to defend their churches and monasteries from forced takeovers planned by Kiev and Bartholomew. The actions of the Ecumenical Patriarchate concerning splitting up Ukrainian Orthodox church is a global demand to destroy the Russian Orthodox Church. This is what Patriarch Kirill said while speaking in Moscow at the VIII festival of the Orthodox press “Faith and the Word”. Answering journalists’ questions, the patriarch shared his impression of contacts with Bartholomew, who blocked all attempts at a peaceful resolution. He didn’t specify who exactly is behind this ‘global demand.’ But we very well know (and I discussed it in detail in my recent report – see link below) that the emissaries sent to Kiev to facilitate the schism are one from the US and another from Canada, and both of them are originally from Western Ukraine, where the Bandera ukro-nazi movement originated. One of them used to work for the US State Dept. They both are rabidly Russophobic and bent on turning Ukraine into anti-Russia. In my complete report I also talked to you about a strange ‘coincidence,’ overlooked by most. Geoff Pyatt, the US ex-ambassador to Ukraine, who together with Victoria Nuland orchestrated and presided over Kiev Maidan and coup in 2014, is now the ambassador to Greece, successfully subverting it in the direction of Russophobia. And what was Greece? One of Russia’s biggest long-term allies in the EU for years. And who is the Constantinople Patriarch Bartholomew? He is a Greek, living in Turkey. And who are the majority of his parishioners? That would be the members of Greek Orthodox churches in Canada and US. MY COMPLETE ANALYTICAL REPORT ON THE SUBJECT CAN BE FOUND ON PATREON!